Cut Short is a large root-filled assemblage/painting in which Dial reflects on the tribulations of the black experience and the frustrations of failed attempts at self-improvement. Cut Short is a large root-filled assemblage/painting in which Dial reflects on the tribulations of the black experience and the frustrations of failed attempts at self-improvement. The piece focuses upon an elongated, emaciated male figure in short pants. "Cut short" is a slang term for short-changed, not being given one's due. Dial says it also refers to the embarrassment a black laborer suffers when forced to wear short pants. 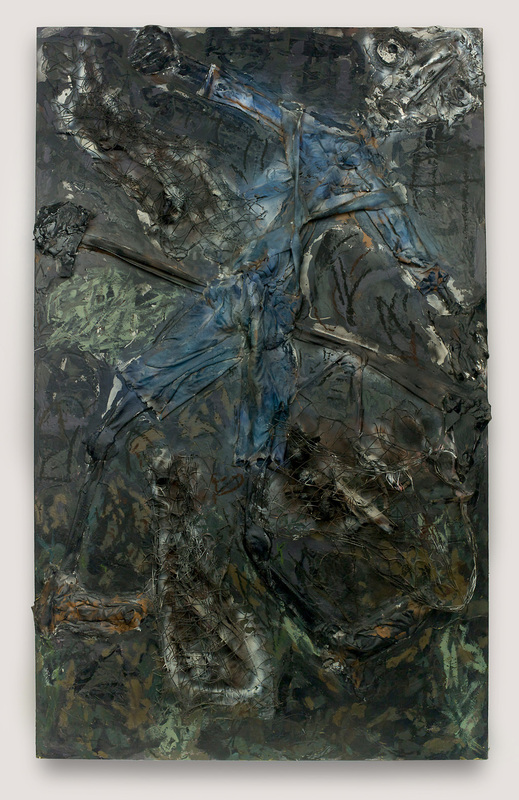 In this work the protagonist is transformed into the victim of a crucifixion, surrounded by an array of metaphorical references to black struggles. Small wire cages scattered around the work contain twisted roots: African Americans unable to break free, or charms to ensure that they will. One of the enclosed roots is wrapped in strips of torn fabric and coiled into the shape of a small cat, a baby tiger. It is Dial's symbol of hope. Pieces of steel-belted rubber tires are encased in wire, another common Dial symbol for hope/hopelessness: the most unsightly and useless materials on the side of the road are discarded blown-out tires, but when recycled, they roll again. In the spaces surrounding the roots, painted abstract forms represent shotgun houses, factories, and woods, the only places where blacks were allowed to be in Dial's time. Cut Short has the colors of pollution and industrial waste. Cut Short is about degradation.